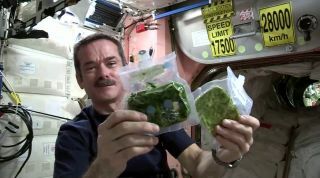 Canadian astronaut Chris Hadfield shows what spinach in space looks like when it is still dehydrated (right) and ready to eat after rehydration (left) in a space cooking lesson during his Expedition 35 mission in March 2013. It's not all peanut butter and honey sandwiches at the International Space Station. Astronauts have to eat their veggies, too, and one space man has created a zero gravity cooking video guide to show how it's done. Canadian astronaut Chris Hadfield, the charismatic commander of the space station, has made a point of showing just what living in space is like by posting amazing photos, videos and even sounds of his work in orbit online for the public to enjoy. But perhaps the most entertaining are his videos of zero gravity cooking, an apparent series he's dubbed "Chris' Kitchen." Hadfield's latest creation is a no-nonsense video of spinach ala space. Hadfield demonstrated how, "like magic," dried spinach becomes cooked spinach, ready to eat. He even showed off how to take a bite from a spinning spoon using no hands. Hadfield has already created a video of how to wash your hands in space — a must for any would-be cook, on or off the planet. Without gravity, astronauts squeeze slightly soapy water out of a pouch, rub the floating ball of liquid around their hands and dry off with a towel. He followed that quickly with a step-by-step guide on how to make a space peanut butter and honey sandwich, using a special tortilla that doesn't make crumbs and can stay good for 18 months. "There's all sorts of things that we normally consume on Earth that we have here in space — we just need some minor adaptations," Hadfield said of his sandwich, adding that tortillas are better than bread in space for one reason: no crumbs. If that meal looks less than appetizing, Hadfield assured in another video last month that astronauts enjoy greater variety in their food than the pioneers of space exploration, whose provisions were mostly squeezed out of tubes and brought up in dehydrated packets. In addition to his cooking lessons, Hadfield has also made videos to show how grooming gets done in zero gravity. And just like you wouldn't cut your fingernails at the kitchen table on Earth (hopefully), you have to be choosy when you trim your nails in space, since a floating clipping could end up in an astronaut's eye or mouth. (Yuck!) Hadfield trims his nails over an air duct so that the trimmings get sucked down into the vent, where he could eventually vacuum them up. Hadfield is one of three astronauts currently living on the International Space Station as part of its Expedition 35 crew. He is Canada's first commander of the space station, with NASA astronaut Tom Marshburn and Russian cosmonaut Roman Romaenko rounding out the crew. On Thursday (March 28), three new crewmembers will launch to the space station. A Russian Soyuz rocket will launch NASA astronaut Chris Cassidy and Russian cosmonauts Pavel Vinogradov and Alexander Misurkin on an unprecedented single-day crewed flight to the orbiting lab. Russia's Federal Space Agency has sent unmanned Progress spacecraft to the space station on one-day rendezvous, but Thursday's launch will mark the first time the six-hour flight will include a human crew. The International Space Station has been permanently staffed with rotating crews since 2000, when the first three-person team took up residence. Construction of the $100 billion orbiting laboratory began in 1998, with five different space agencies and 15 countries participating in its assembly. Visit SPACE.com on Thursday for complete coverage of the single-day Soyuz launch to the International Space Station.